Over 390,000 migrants passed through Hungary on their way to Western Europe from the beginning of 2015 until the Orbán government sealed the Hungarian-Croatian border on October 17, thus essentially putting an end to migration through the country. Below are basic demographic statistics regarding the number, age, gender and nationality of these migrants. The National Police Headquarters (ORFK) reported that its officers had taken action against 390,901 “illegal immigrants” between January 1 and November 1 of 2015 (source in Hungarian). Throughout the spring, the number of migrants—by then exclusively non-European—ranged between 200 and 400 per day (source A, B and C in Hungarian). The number of non-European migrants to arrive to Hungary per day en route to Western Europe rose above 500 for the first time on June 2, then above 1,000 for the first time on June 24 and above 1,500 for the first time on June 26 (source in Hungarian). The number of migrants to Hungary remained between 1,000 and 1,500 per day throughout the month of July, spiking above 1,500 seven times during the second half of the month, though never exceeding 1,700 (source in Hungarian). The number of daily migrants to Hungary surpassed the next five 500-increment thresholds during the second half of August and the first half of September—2,000 on August 16, 2,500 on August 25, 3,000 on August 26, 3,500 on September 10 and 4,000 on September 12—before jumping to more than 5,800 on September 13 and over 9,300 on September 14 as migrants traveling the West Balkan migration route rushed to get into Hungary from Serbia before the announced closing of the final gap in the newly built razor-wire fence along the border between the two countries on midnight of the latter date (source A and B in Hungarian; see also The Curtain Falls Again). After a three-day lull following the closure of the Hungarian-Serbian border, migrants began entering Hungary via Croatia in even greater numbers over the next month until the Orbán government sealed the Hungarian-Croatian border on the early morning of October 17: between September 18 and October 16, a total of 188,010 migrants entered Hungary from Croatia, or an average of 6,438 per day, jumping to a single-day high of 10,046 on September 23 (source A and B in Hungarian). Slightly over 48 percent of all migrants who passed through Hungary in 2015 therefore did so during this 29-day period in which the Orbán government was simply shuttling migrants through Hungary by train from the Hungarian-Croatian border directly to the Hungarian-Austrian border without registering asylum claims. The 500-increment daily thresholds of 2015 non-European migration to Hungary were reached on the following dates: 500 on June 2; 1,000 on June 24; 1,500 on June 26; 2,000 on August 16; 2,500 on August 25; 3,000 on August 26; 3,500 on September 10; 4,000 on September 12; 4,500 to 5.500 on September 13; 6,000 to 9,500 on September 14; and 10,000 on September 23. Source: Hungarian Academy of Sciences. 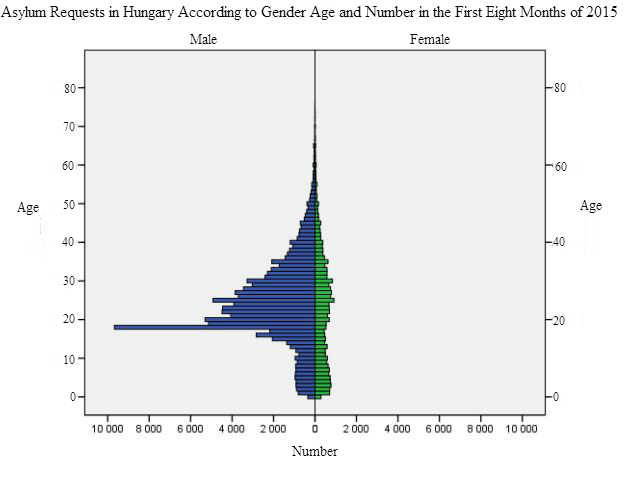 According to a Hungarian Academy of Sciences report, the average age of the 132,006 migrants who submitted asylum requests in Hungary during the first eight months of 2015 was 23.8 years old—24.2 years old for males and 22.5 years old for females (source in Hungarian). Interior Minister Sándor Pintér, citing Office of Immigration and Nationality data, announced on October 21 that 62 percent of the 175,963 migrants who submitted asylum requests in Hungary in 2015 were male adults, while 17.5 percent were male minors, 12.1 percent were female adults and 8.4 percent were female minors (source in Hungarian). Therefore 74.1 percent of these migrants were adults and 25.9 percent were minors. According to the Hungarian Academy of Sciences report, 79.2 percent of migrants who submitted asylum requests in Hungary during the first eight months of 2015 were male, while 20.8 percent were female. According to Interior Minister Pintér, 79.5 percent of migrants who submitted asylum requests in Hungary during the first ten months of 2015 were male, while 20.5 percent were female. The Hungarian Academy of Sciences report confirmed that Kosovars constituted the vast majority of migrants who passed through Hungary in January and February of 2015, then essentially stopped arriving to the country on March 1. 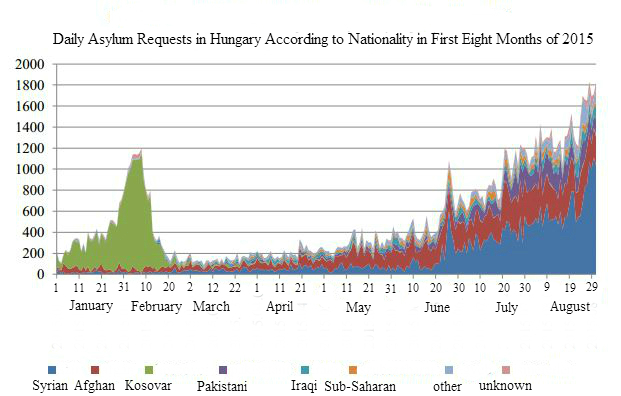 The report shows that Afghans and Syrians subsequently composed the greatest number of migrants to Hungary in roughly equal measure from around February 20 to May 10, before Afghans began predominating on the latter date and then Syrians beginning on June 20 throughout the rest of the 2015 migration through the country to Western Europe. According to the report, approximately three-quarters of the slightly over 132,000 migrants who submitted asylum requests in Hungary in the first eight months of 2015 were from Syria, Afghanistan and Kosovo. The total distribution of migrants who passed through Hungary during this period according citizenship was as follows: Syrian, 31.1 percent; Afghan, 25.7 percent; Kosovar, 17 percent; Pakistani, 9 percent; Iraqi, 5 percent; Sub-Saharan African, 4.1 percent; and other or unknown, 8.1 percent. A total of 62 migrants were granted political asylum in Hungary during the first eight months of 2015. See Hungarian Academy of Sciences Report Az Európába irányuló és 2015-től felgyorsult migráció tényezői, irányai és kilátásai (Factors, Trends and Prospects Regarding the Migration toward Europe that Accelerated in 2015).